Brought to the Caribbean by the French settlers, Carnival uniquely forms part of our identity. Carnival, an annual event in Trinidad and Tobago versus Carnival held in Guadeloupe that is how I would sum up the documentary titled Mas. The adage states that, ‘you cannot play mas and fraid powder!’ Director Jessy Schuster confidently brought to life this idea of being a participant of Caribbean Carnival celebrations. The documentary Mas expressed much of what I have been previously exposed to since a young child playing in sailor costumes back in primary school. The expression of a rainbow of colours, music, dance, happiness and laughter symbolises the feelings of masquerades on Carnival Monday and Tuesday. In Trinidad and Tobago Carnival commences soon after Christmas with fetes or Soca parties every weekend till Fantastic Friday, this is where people are permitted five days to parade through the streets of Port of Spain. However, once the clock strikes 12 midnight on Tuesday it signals the beginning of lent therefore all celebrations must end and a length of 40 days reflection begins. During this observation by the Roman Catholic society, time is allocated towards prays and fasting till Easter. 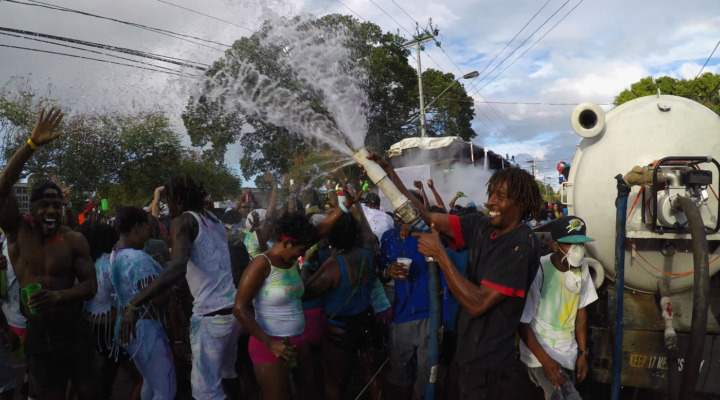 Guadeloupe’s Carnival celebrations did not appear to be an immense difference according to spokeswoman Nottingham in Mas, whom visited the country to experience this festival of colour. In the film she mentioned a lot of details which depicted the meaning behind Carnival and why it has evolved from a privately secluded French party to crowds of people in costumes parading the local streets. Pre-Emancipation period did not allow the African slaves to participate in any type of celebrations because their slave masters were afraid that they would become rebellious and destroy the plantations along with their owners. As such, the Africans were helplessly forced to stare in awe through the delicately designed windows of their slave owners for a peek of the elite French Carnival. This picture brought about a massive change and on August 1st 1834 when all slaves were freed and slavery was abolished, Carnival was transformed with the help of Calypso, Soca, Rapso and reggae music. The Africans incorporated their instruments such as drums, sticks and bamboos into their music and dance. Today, Carnival is portrayed as the biggest show on earth with an influx of foreigners who visit these two Caribbean islands each year and help generate revenue to the local entrepreneurs. If you have a desire to play mas, but anxious of being in an open space with strange people adorned in beautiful creative artistic designs, then the documentary Mas is for you. We may not have been considered equal although everyone was free after slavery, but Carnival has the ability to display equality, fun and enjoyment.